In celebration of National Puppy Day, this college’s Student Government Association hosted their annual Stress Relief Puppy Day March 20 in the mall. March 23 is internationally observed as the time to celebrate puppies and to raise awareness for the adoption of orphaned puppies and dogs. SGA selected Vun-Veq Rescue Center for this year’s featured rescue organization. Vun-Veq Center is a private rescue operated by Juan Vasquez and his wife at their home. “Any animals that come our way are more than welcome to stay in our home,” Vasquez said in an interview March 22. All dogs were spayed or neutered and vaccinated and were sold for $150 in cash. “The reason we were only able to accept cash is because all of our operations are conducted from home. All of our pets are also micro chipped and current with their vaccinations and on heart worm preventative,” Vasquez said. 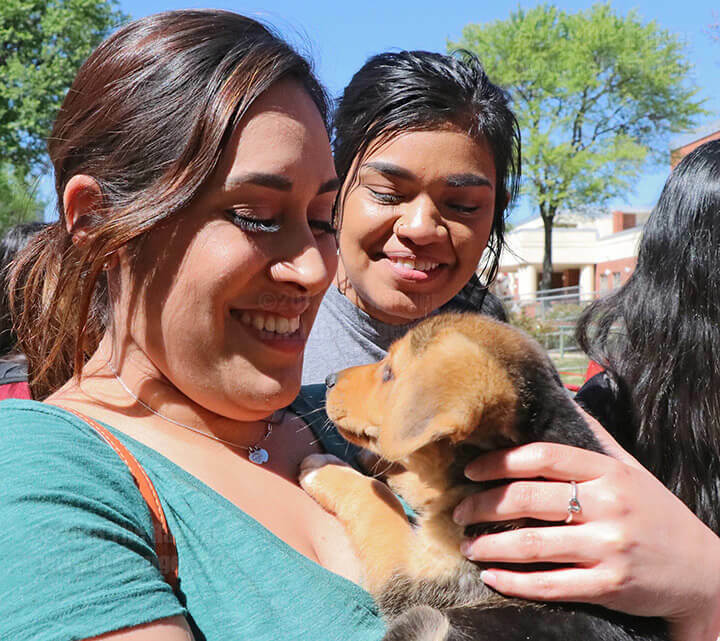 In previous years, Puppy Day has been conducted with San Antonio Pets Alive, a state-run nonprofit rescue organization, in previous semesters for the past five years. “We are a 501(c)(3) nonprofit organization meaning that all donations go towards supporting our many life-saving programs to include the mobile adoption programs. We can provide any and all tax-related receipts or documents if needed. There will be a fee of $300 for requesting our organization to come to another location,” Denise Trevino, faculty manager at San Antonio Pets Alive said. This was the first year that SGA has partnered up with Vun-Veq Center. “The reason we chose to work with Vun-Veq Center for the first time this year rather than larger nonprofit organizations such as Pets Alive is that there was no fee for requesting them to come out to our campus,” SGA President Kayla Salwey said during an interview March 22. “We receive our dogs and cats from owner turn-ins and also have a partnership with Petco,” Vasquez said. Vun-Veq also brought out a variety of other animals such as two dwarf rabbits for $40 each, three guinea pigs for $20 each, one large rabbit for $25, two mini turtles for $15 each and one large turtle for $10. All animals were adopted by 1:30 p.m.
“As a fellow student at San Antonio College myself, I think that we get so caught up and busy with our academics that we don’t take any time for ourselves to relax,” Salwey said. “I think that having a puppy day is important because it reminds people to just take a breather and have some fun,” she said. If students would like to adopt from Vun-Veq Center, more information is available on www.adoptapet.com/vun-veq-rescue/ or send a letter to P.O Box 202099, San Antonio TX 78220. For more information, call Kayla Salwey at 210-486-0133 or Juan Vasquez at 210-863-1858.